Professional Installation Services You Want! Trusted residential and commercial contractor in Colorado. We’re going to say something that no other roofing and siding contractor will tell you: There is more than one good roofing, siding, and window company out there for your needs. That’s right: We’re an exterior roofing and siding contractor located in Fort Lupton Colorado and we think we’re great, of course, but we don’t have some monopoly on doing a good job. We’re all about honesty and craftsmanship, and that’s why we’re being straight with you. So yes, some other contractors in Fort Lupton Colorado also do a good job. But here’s the tough question: How can you tell who’s good and who is not? There are so many! 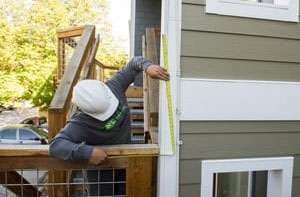 In fact, in the metro Denver area there are more than 600 contractors do some combination of roofing, siding, and window work. That’s too much choice! They all seem to look alike, right? They all have pretty pictures, and all talk about “our people make the difference in siding” and how they have “outstanding service in roofing”, “world-class cladding products”, and so on. If you’re not in the business, and you don’t have a friend who recently had work done, how can you figure out who’s who? How can you separate the gems, from the amateurs, from the fly-by-night outfits? I dealt exclusively with my project manager at NLE. He laid out my options, worked well with my insurance company, kept me informed and quickly responded to my questions. I never felt pressured. Wes managed to have repairs on my house completed before many of my neighbors even got started. The workmanship on the roof, windows, gutters and paint were excellent. We might still be able to work with you! Copyright © 2019 Northern Lights Exteriors | [whelk] made!